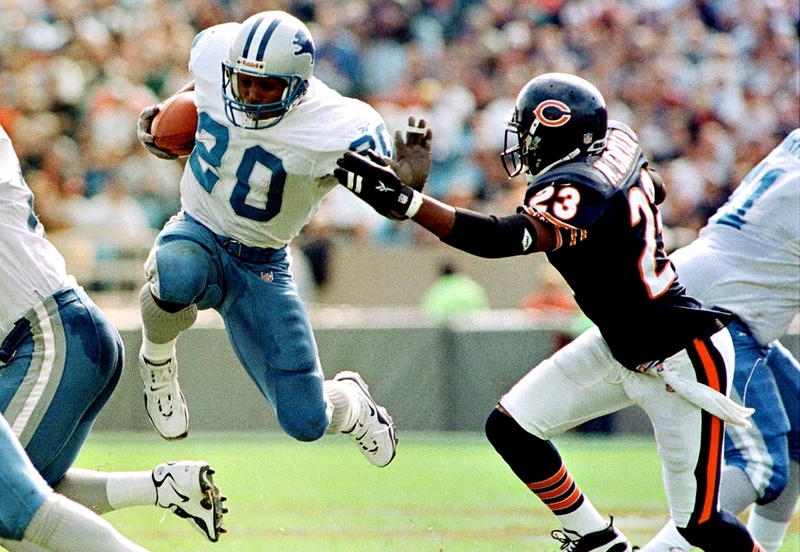 Happy 48th Birthday Barry Sanders! It is hard to believe that Barry Sanders turns 48 years old today and that it has been 18 years since he ran wild through the NFL. Seems like just yesterday that Sanders was winning the Heisman Trophy at Oklahoma State and then dazzling the NFL with his elusiveness. After serving as the under-study to Thurman Thomas for two years at Oklahoma State, Sanders exploded onto the scene in 1988 with a mind-blowing 2,628 yards rushing in just 11 games. He also scored 37 rushing touchdowns and also scored returning both a punt and kickoff. Part of the star-studded 1989 draft in which four of the top five picks eventually earned a spot in the Pro Football Hall of Fame, Sanders was chosen third by the Detroit Lions. He finished second in the NFL in rushing as a rookie and won the first of his four rushing titles the next year. By 1991, Sanders had the Lions in the playoffs as they defeated the Dallas Cowboys in their playoff opener before losing the NFC Championship Game to the Washington Redskins. Though the Lions would make four additional playoff appearances during his career, they were eliminated in their first playoff game each time. Sanders reached his zenith in 1997 as he eclipsed the prestigious 2,000 yard mark with 2,053 yards. After gaining 1,491 yards as the Lions went 5-11 in 1998, Sanders surprised the sports world by retiring prior to the 1999 season. He was less than 1,500 yards from passing Walter Payton for what was at the time the top spot on the NFL all-time rushing list. Because he had just turned 31 years old and had showed no signs of slowing down, his retirement was quite a surprise. In some ways, it mirrors the recent retirement of the best Detroit Lions player since Sanders as Calvin Johnson seems to also be done with the NFL at the age of 30. In honor of Sanders amazing NFL career, here are some vintage clips of his once-in-a-lifetime moves.